Sometime between 0515 and 0550 on May 4, 1945, Ensign Kunio Ōtani took off from Kushira Air Base as pilot of a Type 97 Carrier Attack Bomber (Allied code name of Kate) carrying an 800-kg bomb with a crew of three men. He was a member of the Kamikaze Special Attack Corps Hachiman Shinbu  Squadron from Usa Air Group. He died in a special (suicide) attack off Okinawa at the age of 22. He was from Fukuoka Prefecture, attended Keijō Imperial University in Seoul, and was a member of the 14th Class of the Navy's Flight Reserve Students (Hikō Yobi Gakusei). Please be glad. When I departed and rejoined my unit, I was given a noble place to die. Tomorrow I will attack in high spirits. The target is an enemy aircraft carrier or warship. The time that I will compete with cherry blossoms is 9 p.m. on May 4. I have no complaint. I only want to tell you thank you for my upbringing of 23 years . I look forward to your praising me, "Kunio, well done." Please give my regards to all the relatives and also to Hiroshima. The letter and poem come from Matsugi (1971, 128). 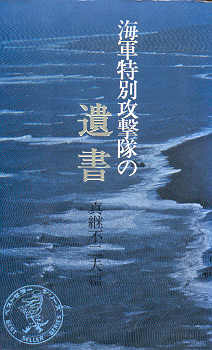 The biographical information in the first paragraph comes from Matsugi (1971, 128) and Osuo (2005, 219). 1. Hachiman is the Japanese god of military power. Usa City in Ōita Prefecture has the first Hachiman Shrine, which was established in the early 8th century. Shinbu means "military might" in Japanese. 2. The traditional Japanese method of counting age, as in much of East Asia, regards a child as age one at birth and adds an additional year on each New Year's day thereafter. This most likely explains why the letter indicates his age as 23 whereas the current way of counting age based on his birth date in Matsugi (1971, 128) indicates that his age was 22 at time of death.